Fig. 1: Antonio Neri, "Ars Preparatio Metallor[um]"
in Tesoro del Mondo, f. 8r. Recently we examined three of a set of four illustrations drawn by priest Antonio Neri in a manuscript started in 1598. They show various "arts" being practiced involving items found in nature; plants, animals, stone and today's subject: metals. After an examination of Neri's "Art of Preparing Metals" we will take a look at another picture on the same subject, this time a painting titled the "Goldsmith's Workshop" by Alessandro Fei. It was executed a few years before Antonio was born, but bears some remarkable similarities in subject matter. First, the manuscript illustration (fig. 1, click to enlarge): At center left, we see a special furnace construction which the label tells us is for "reverberation and calcination." Two crucibles sit inside, exposed to the heat. These are both procedures with which Neri was quite familiar. 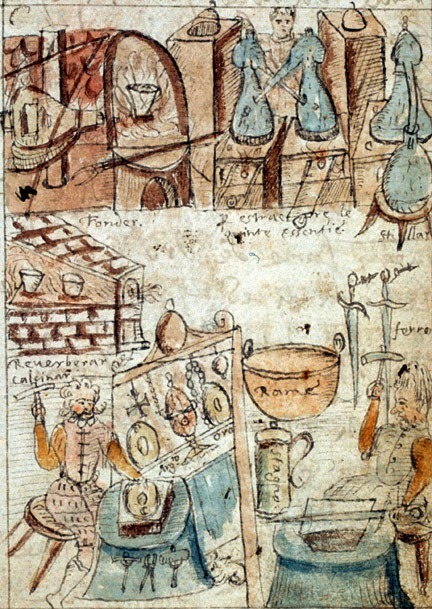 In the recipes of his glassmaking book, L'Arte Vetraria,  he speaks numerous times about what was called "calcination"—the reduction of a metal into what is usually a powdered oxide form. This was a fundamental operation in producing the pigments for glass. "Reverberation" was exposing a material to secondary heat reflected from the inner walls of the furnace chamber; it was a more even heat than that produced by a direct flame. Above the reverberation furnace is a foundry furnace, used for melting metals. Because of the high temperatures that needed to be achieved, it has a large bellows attached to force air into the fire causing a "blast" effect, which causes the fire to burn faster and hotter. Resting on the hearth is a long pair of pincers used to insert and remove crucibles of molten metal. To the right, we see a curious arrangement of two glass retorts, each feeding into the other. They sit on purpose built stoves. The chimneys are capped by dome shaped dampers to control the draft and paddle mechanisms in front regulate heat under the glassware. A worker tends the apparatus, and the caption below reads "for extraction of the quintessence." Neri's other writing makes plain that this "quintessence" was a material that exhibits such a harmonious blending of the four essences: air, water, fire and earth that a new fifth essence (supposedly) emerged with extraordinary properties. To the right is a similar stove set-up with a single retort which is labeled "distilling." This station might have been used in preparation of the acids needed to purify metals. At lower right, a blacksmith is hammering a piece of iron into a sword on an anvil. High-carbon "steel" was being made and used in the Medici court at the time, and that may well be what the smith is working with. Around him are several examples of his art, including two finished swords, a large copper bowl or cauldron, and a covered drinking stein made of tin. To his left, we find a goldsmith, also hammering on an anvil, fashioning a silver platter. Displayed behind him are a variety of his handiwork, including more platters, gold necklaces and crosses and other ornamentation. A number of tools hang along the bottom of the anvil station, and behind it a small dog is curled up on the floor. About twenty-five years before Neri wrote his manuscript, Alessandro Fei painted a similar picture (fig. 2). Here we are treated to a view of a royal foundry housed in the yet to be completed Uffizi palace. There is a remarkable concordance between this painting and Neri's illustration, right down to a small dog, hanging around the goldsmith's bench. The central figure of the painting is Francesco de' Medici, seated in the foreground, inspecting his father's gold crown at a workbench. 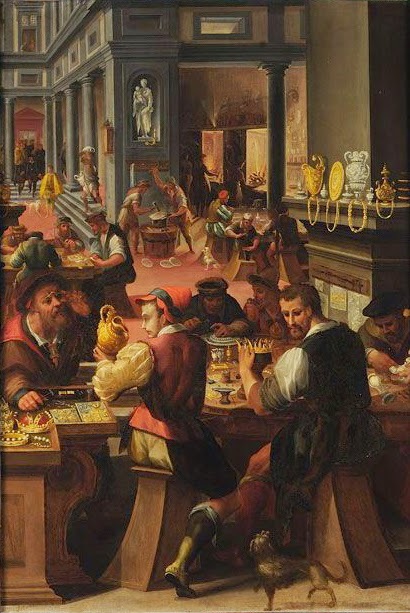 The dog is playfully engaging with the future Grand Duke, while on the opposite side of the bench, two other men are amiably discussing their work, perhaps silver chasing.To the left of Francesco, a younger man examines a gold ewer in the company of an older goldsmith seated across the table. The artisan is wearing spectacles and (although it is hard to see) he holds a small hammer in his hand. A worker to Francesco’s right is also intently engaged in his work. In the right mid-ground we find a small furnace with a tall chimney leading upward. On the mantle are displayed a number of gold and silver items, including platters, vessels and chains or necklaces. To the left, four men are busy seated around a large workbench. Behind that group, toward the center of the picture, are two men working at an anvil and three more at another bench on the right, accompanied by a second small dog. In an enclosed area in the background we see two large open furnace hearths, with their fireboxes glowing from underneath and men working in close proximity. In the far left background is a group entering the work area, including a figure in a yellow cape accompanied by a third dog. The one element present in Neri's illustration that is missing in the painting is the glassware. Metalwork was a venerated and mature art long before Neri's era, which is underlined by the similarity of the two scenes, even though they are a quarter century apart, the tools, equipment and work methods are identical for all intents and purposes. 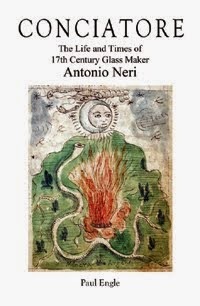 There is no doubt that chemistry and distillation apparatus were used by the earlier metals artisans, the fact that Neri chose to emphasize this aspect of the work is a clear indication of his own interest and a foreshadowing of his future involvement in the production of the glass itself. In several of Neri's glass recipes the result of "calcination" is a sulfide.